A classic! If you're unfamiliar with Mercenaries, Spies, & Private Eyes, you're in for a real treat! Written by Michael Stackpole back in the early eighties, MSPE is a complete roleplaying game that was constructed using Tunnels & Trolls as the underlying framework. The game, right up there with TSR's Top Secret when it comes to the category of "fun spy RPGs of the eighties," was first published by Flying Buffalo and later by Sleuth Publications, but it never seemed to achieve more than a cult status when it came to overall sales and popularity. That had nothing to do with the quality of the work -- Stackpole, as you should know, is a master -- but the glut of RPGs at the time, combined with the challenges in reaching a new audience, limited the game's overreach. 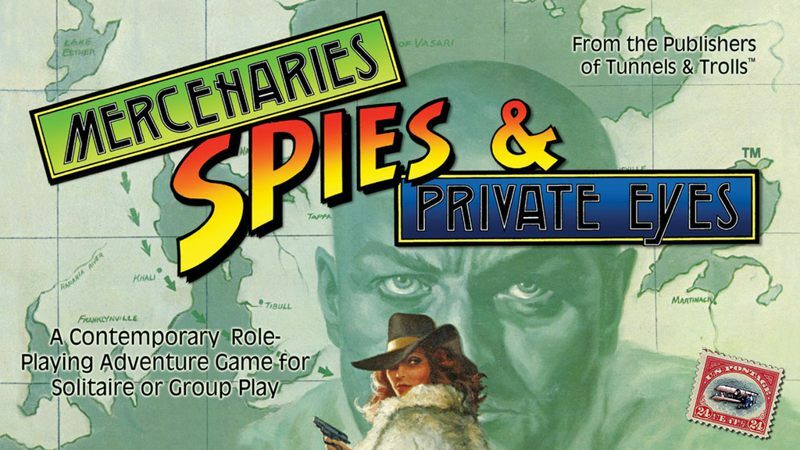 Now, thanks to the magic of the internet and Kickstarter, Flying Buffalo is bringing back Mercenaries, Spies, & Private Eyes in a revised edition that combines the best of the Flying Buffalo and Sleuth Publications versions of the game. Having only ever owned the Sleuth Publications edition, I instantly jumped on this Kickstarter campaign and am very much looking forward to the game. And at only $6 for the PDF, you should definitely also join in and help this classic return. Great stuff at an incredible price? What RPG fan could resist this game?